For some of us, prayer comes easily, perhaps because it is something we just do naturally, or because we are in the habit, or because the melodies and the language immediately connect us to tradition or to a Presence that is larger than ourselves. For others, prayer is challenging or foreign or perhaps even uncomfortable. It may be that we aren’t familiar with Hebrew, or the melodies are new to us, or that we’re not sure to whom we are speaking when we pray. At CBSRZ, our goal is to create a variety of prayer experiences that are accessible and meaningful, by using a mix of approaches. On Shabbat and holidays, we use the Reform prayerbook Mishkan Tefilah, and on the High Holy Days we use Mishkan Hanefesh, both of which transliterate all Hebrew prayers into English letters, allowing non-Hebrew readers to more easily participate. We sing as many of the prayers as possible, and we try to balance familiar, traditional and more contemporary melodies. Our Rabbi and Cantor share leadership from the bimah (pulpit), and the community sings, claps and participates energetically. Some services feature piano accompaniment. Others include guitar, and sometimes drums. Others are a capella. Once a month our choir, under the direction of Meg Gister, enriches and supports our prayers. Periodically, trained lay people lead services. At some services you may find that we incorporate silent meditation, or open the doors to the Meditation Garden for folks to pray on their own in the outdoors. We have also begun a periodic PrayerLab in which the Cantor and Rabbi experiment with forms of prayer such as chant, meditation and movement. We gather every Friday night to welcome Shabbat. On a monthly basis, and when we are celebrating a Bar or Bat Mitzvah, we gather on Saturday mornings for Shabbat prayer and Torah reading. We celebrate the holidays with lively services and of course, lots of food. On Chanukah and Simchat Torah, the music of our in-house Klezmer band, A Klez Act brings an added layer of simcha (joy) to our prayer. 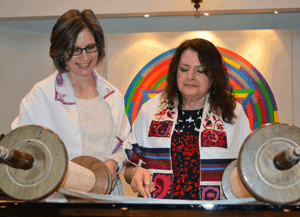 The High Holy Days are a rich spiritual experience with soaring music, rich teachings and a warm sense of community.